← What If? Rejects #11.2: Fire Tornadoes! Well, Star Wars Episode VIII is here, and it’s proving to be not only the biggest movie of the year, but also one of the most controversial. Not in the news headlines, that is, but quietly, in the actual audience reaction. 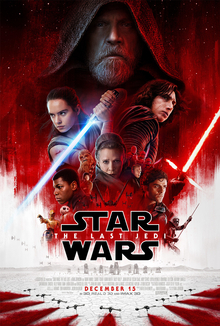 Rotten Tomatoes rates The Last Jedi at 93% fresh from the critics, but only 56% from the audience. Why? Well, that’s complicated, but I think a big part of it is that it changed the “flavor” or style from the original Star Wars. My opinion, though: I really liked it. Yes, the style was different. A friend of mine put it more lucidly than I ever could when he said, “It had a little too much Marvel in it.” But despite this, I really liked The Last Jedi. I honestly thought it was the best Star Wars movie yet. Yes, they changed the tone some, but I think, dare I say it, that those changes were necessary and made for a better movie and a better franchise. It will take more space than I have here to explain all of my thoughts about The Last Jedi. I’ll dedicate a separate post to this subject later, but the short version is, I thought it was a fresh new take on the series and also redeemed the franchise in certain key ways. For now, though, let’s just go through the basics. The writing. This was a really good story overall. The biggest flaw of The Force Awakens in my opinion was that it “rhymed” (as George Lucas would put it) with A New Hope too much. It made the rehashed new Death Star plotline almost into a crutch. The Last Jedi finds its feet much better. I really liked how it called back to The Empire Strikes Back in certain ways, then subverted it, and then it called back to The Return of the Jedi, but it subverted that, too, finally making its own way at the end. Some fans may not like this, but I think it was one of the best things they could have done. Mark Hamill. I saw a headline recently, which I unfortunately can’t find now, that read something to the effect of, “In The Last Jedi, Mark Hamill reveals that he’s actually a good actor.” Luke was fantastic in this movie. From the jaded, reluctant teacher to fighting Kylo from the far side of the galaxy, his role may not have been as big as fans would like, but his larger than life presence really made itself known throughout. Rose Tico. The Last Jedi’s best new character has to be Rose Tico, the new love interest for Finn, played by Kelly Marie Tran. From a maintenance worker trying to stop deserters to ramming Finn’s speeder to save his life (albeit not the smartest move under the circumstances), Rose is one of those great Star Wars characters you want to see more of. The kids. This was another one that some fans disliked, saying it was unnecessary, but I think the ending ties it all together. The kids are the legacy that will start the Resistance and the Jedi anew, and in some ways, they’re one of the more important parts of the film. The jokes. This is one of those places where many fans felt a little hesitant. The jokes in this movie are where you most feel Marvel rubbing off on it. Still, when I went to the show, the jokes had the packed theater house laughing and even cheering at times, and I think they were a reasonable addition. Carrie Fisher. This is not because I thought either Leia’s part in the film or Carrie Fisher’s acting were bad. They were both excellent. The problem is that the writing was clearly setting up Leia to be the new leader of the Resistance (and maybe of the Jedi, too), making her more important than ever before…and now Carrie Fisher isn’t around to do it. This was such a major issue that I’ve heard some fans saying they should recast Leia for Episode IX. The Porgs. The Porgs, thankfully, are not the new Ewoks, let alone the Gungans. They’re basically just little pets or at worst a mascot without enough screen time to get annoying. So there you have it: my thoughts on Star Wars: The Last Jedi. In my opinion, the good far outweighs the bad, so if you haven’t seen it yet…what are you doing reading this? I told you there were spoilers down here! But in the end, I think this was a worthy installment that makes the series better than ever. This entry was posted in Movie Reviews and tagged Star Wars, Star Wars: The Last Jedi. Bookmark the permalink.